Popes, Saints, Blesseds and other Important Devotees of Saint Philomena. Pope Leo XII Declared Saint Philomena, The Great Thaumaturgist of the 19th century. Leo XII, over and over again, expressed the highest admiration for the extraordinary power confered by the Almighty on this hitherto unknown child Saint, and listened with delight to the accounts given him of the wonders she worked. So authentic did he account the information he received and so irrefutable the facts related to him that, notwithstanding the extreme care which the Church usually takes in such matters, he had no hesitation in allowing alters to be dedicated and chapels to be erected in her honor. Pope Gregory XVI Named her Patroness of the Living Rosary and conceded to her the Universal cult. Gregory XVI was himself a witness of the great miracle of Mugnano, the cure of Pauline Marie Jaricot. He visited her in Rome before her departure for Mugnano and verified for himself the desperate condition in which she lay. On her return to Rome Miss Jaricot was received by the Sovereign Pontiff with the warmest affection. He did not conceal his amazement exclaiming: "Is this indeed, our daughter or is it a vision from the other world?" Thought profoundly touched by what he himself declared to be a "miracle of the first class" he in nowise relaxed the rigorous laws of the Roman tribunals. On the contrary he commanded the Sacred Congregation of Rites to proceed at once to a thorough investigation of the cause. The difficulties that had arisen were carefully analyzed, the doubts that had been raised were sifted to the utmost. All the facts from the discovery of the relics in 1802 to the latest miracles worked by the Saint were subjected to the minutest scrutiny, and this by the most experienced and keenest experts in Rome. After a protracted examination the Sacred Congregation gave a full and favorable decision in favor of the cult of the Saint. Yet the Holy Father, notwithstanding his own personal love for Saint Philomena, spent two more years in prayer and deliberation before making his final renouncement. At last to the great delight of the Saint's devoted clients, among whom were numbered several distinguished Bishops, Archbishops and Cardinals, the Solemn Approval of the Church was made public. This was so complete and conferred so much glory on the Saint that it most amply compensated for the delay which had occurred. The Pope was not content that Saint Philomena should be resided to the honors of the altar, and that her feast be established and her office given to the Church, he went much further and declared her to be "the Great Wonder-Worker of the XIX century" thus giving the Church's solemn sanction to those marvelous prodigies alleged to have been worked by the Saint, and effectually silencing the self-constituted critics who had taken on themselves to ridicule her cult in face of overwhelming evidence. Not long after the same Holy Father gave the Saint the new title of Patroness of the Living Rosary. As a last act of devotion and with the object of manifesting his personal affection for the Holy Virgin, the Pontiff sent a magnificent gold and silver lamp to her Sanctuary in Mugnano. 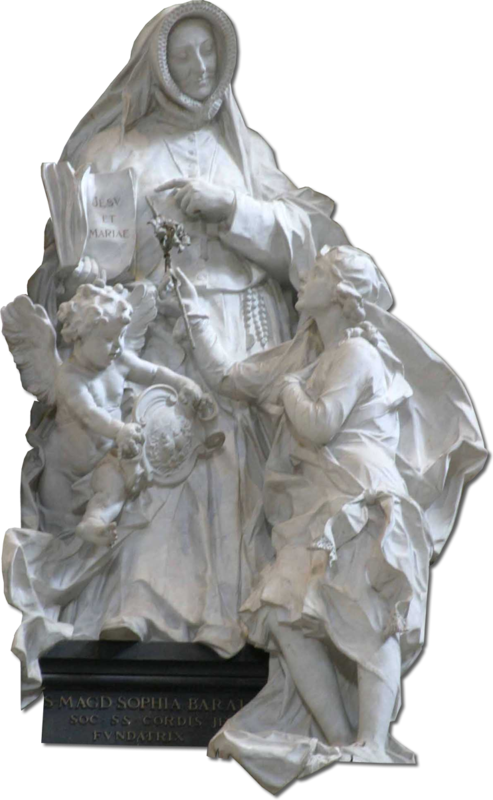 Pope Pius IX Miraculously cured by the Saint. When he became Pope, he made a pilgrimage to her sanctuary on November 7, 1849. Pius IX was, perhaps, of all the Popes, the one who showed most special devotion to the Saint. When Archbishop of Spoleto he was already her devout client and earnestly spread her devotion. Later on, when Archbishop of Imola he fell dangerously ill and the greatest fears were entertained for his life. Near his bedside stood a beautiful image of his dear Saint who was heard to rap distinctly as she sometimes does, when about to perform some great miracle. Immediately favorable symptoms were noticed in the patient and these speedily developed into rapid convalescence. Years rolled by and the Archbishop became the immortal Pontiff of the Infallibility and the Immaculate Conception. Far from forgetting his dear patroness when raised to the throne of St. Peter, this great Pope availed himself of his supreme power to shed still greater lustre on the name of Saint Philomena. To the intense joy of the inhabitants of Mugnano, he went on a pilgrimage to the Shrine of his Benefactress where he was solemnly received by the Bishop of Nola, the King, Queen and all the members of the Royal Family of Naples. He said mass on the alter of the Saint and afterwards publicly venerated her relics. He also declared her to be secondary Patroness of the Kingdom of Naples. In the year 1849 he named Saint Philomena Patroness of the Children of Mary. He granted her, later on, a proper office, which is such an extraordinary privilege that rarely or never has it been granted to any other Saint under similar circumstances. When dying the aged Pontiff sent a most beautiful offering to Mugnano, the last touching tribute of his love and gratitude. Pope Leo XIII While Cardinal, made two pilgrimages to the Sanctuary. 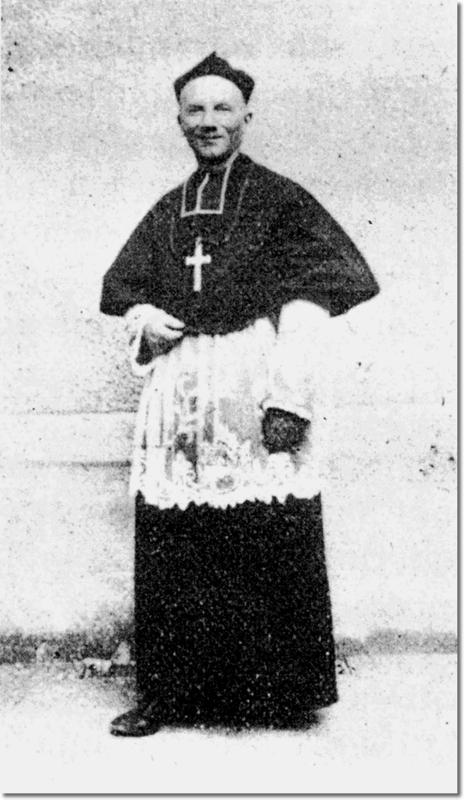 Leo XIII before becoming Pope made two pilgrimages to Mugnano. Later on when Vicar of Christ he sent a valuable cross to the Sanctuary. He approved the Confraternity of the Saint and raised it to the rank of an Arch confraternity, enriching it with important indulgences. St. Pius X Elevated the Pious Archconfraternity of Saint Philomena on May 21, 1912, into a Universal Pious Archconfraternity. St. Pius X was no less devout to the Little Saint, to whom he sent by special envoy a magnificent gold ring and other costly presents. He was always pleased to hear of the wonders she worked. The Servant of God, Sister Maria Luisa of Jesus. A fervent devotee of the Saint. She founded in Naples the religious order of the Sisters of Our Lady of Sorrows and Saint Philomena. The Holy CurÉ of Ars. A great devotee of Saint Philomena, he diffused devotion to her throughout France. Don Francesco De Lucia’s presentiments had not deceived him, as he soon saw for himself. A movement of faith and fervor resulted wherever the name of Filumena was spoken. The little that was known about her reminded people of the early Christians’ resistance and the ambient corruption, the heroism of children and virgins, the chastisement of their persecutors, the failure of brute force against ho9ly weakness. Rome distinguished itself among all cities for its enthusiastic devotion. The young Saint had lived and suffered within its walls. Long buried with her tomb, her name returned to it hallowed with exceptional glory. Wonderful cures would later increase popular confidence in the little martyr. In December 1833, for example, a Franciscan nun, Sister Maria Jesualda Garelli, was virtually resurrected after arriving at the end of her agony. About the same time, in a poor house deep in an alley of the city, a little girl was healed; her grandmother, Anna Maria Taigi, now Blessed, was a devoted servant of Saint Philomena. The husband of Blessed Anna Maria Taigi related a miracle during her process of beatification: "I recall that Peppina, Sofia’s little girl (Sofia was the couple’s eldest daughter), had damaged one of her eyes. 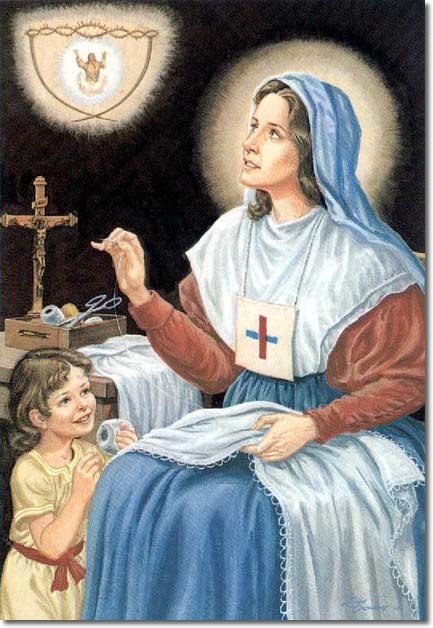 The surgeons said the pupil was torn, and they held out no hope of that cure…The Servant of God made the sign of the cross with some of Saint Philomena’s oil, placed her hand on the child’s head and sent her to bed. 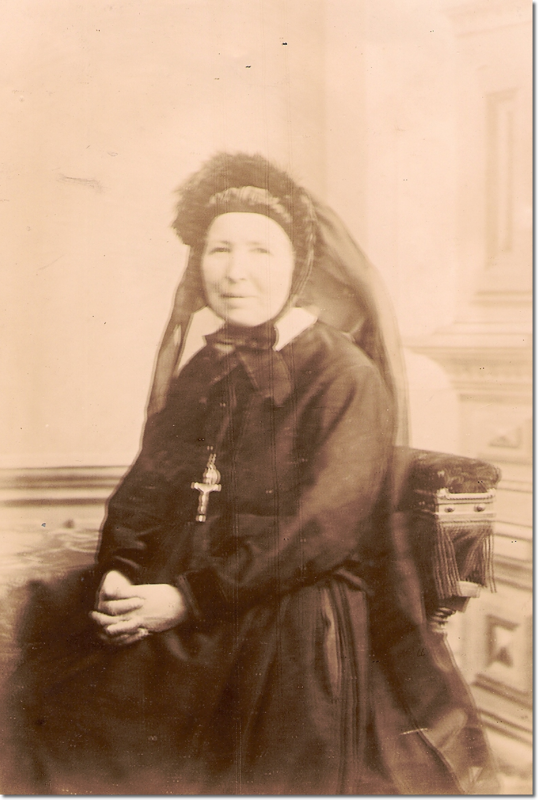 Peppina slept very well, without any pain; the next morning her eye was so perfectly healed that she was able to go to school with the pious Schoolmistresses of Jesus. The surgeon could not believe it; he insisted on making several tests to be sure that she could see." I the same book, Anna Maria Taigi’s biographer declares that the saintly mother daily invoked the little martyr of the catacombs and had her family invoke her. 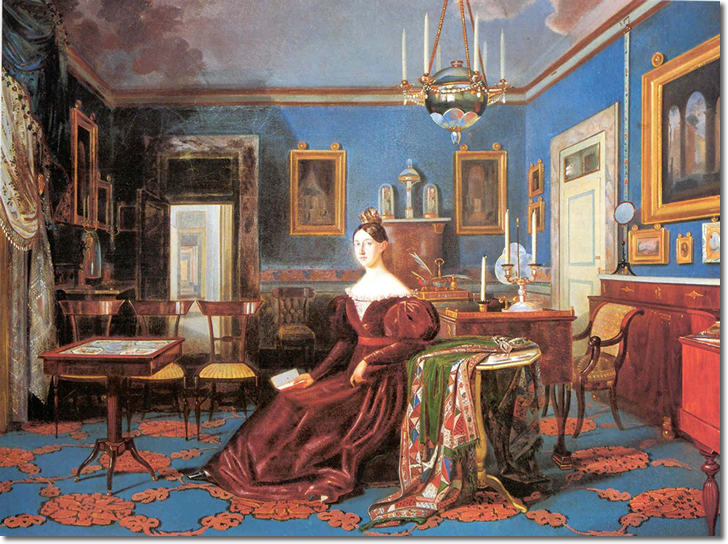 She placed her picture in their home; it is probable, judging from the miraculous event related above, that a lamp burned in front of the picture from time to time. As she lay dying, Anna Maria Taigi, a model of Christian mothers, having given her last recommendations to her children, "placed them especially under the protection of Saint Philomena whose devotion she had always propagated." The list of ecclesiastical and lay pilgrims is almost endless, as the registry at the Sanctuary proves. A few of the names include; General Pietro Vial, Duke of Marigliano; Father Antonin Monnin, S.J., first biographer of the Cure of Ars; Melanie Calvat, seeress of La Salette , who was Sister Mary of the Cross a the time of her visit; Father Alexandre Vincent Jandel, superior general of the Dominicans and one of the first disciples of Lacordaire; Father Louis Petit, director of the Archconfraternity of Saint Philomena and an ardent apostle of the Saint; Dom Sebastian Wyart, abbot general of the Reformed Cistercians; and many, many more. Kings and queens were not the last ones to come and venerate the victim of the pagan Caesars. King Ferdinand of the Two Sicilies made frequent visits to the shrine and favored it with generous donations and privileges. It is said that the wife, Blessed Marie Christine of Savoy, who was to die in the odor of sanctity obtained the birth of King Francis II through her prayers to the Saint of Mugnano. King Ferdinand later established a daily Mass at the reliquary altar for the deceased princess. Depositions made at her process of beatification clearly demonstrate her deep devotion to Saint Philomena. She was beatified by Pius IX. Maria Teresa of Austria had the wax statue clothed with a sumptuous robe. The Queen of Naples gave an even greater honor to Philomena; imitating the Roman matrons who, after the execution of the holy victims, had gone to wash their wounds or gather up their blood with sponges or cloths, she had the glass vial that contained the little virgin’s blood placed in a gilded silver reliquary decorated with splendid garnets. That blood, of which a little blackened dust remained, was from the start especially venerated by pilgrims who sometimes claimed to see mysterious coloration within it. In 1835 Queen Marie Amelie, wife of King Louis Philippe of France, donated a royal mantle to Flumena. A whole array of literature on Philomena began to appear. In 1824, Don Francesco di Lucia wrote his two-volume Historical Relation of the Translation and the events resulting from it. Then, the rector of Our Lady of Grace church, Monsignor Gennaro Ippolito, devoted almost eighty pages of his Memoirs to relations of miracles worked by the Saint’s intercession. Besides narrating a great number them here and there throughout the book, he included a hundred others in chapter 25, especially reserved for that purpose. And then the liturgists came onto the scene. Attempts were made to obtain official approbation for this devotion which had begun in the catacombs. In 1833 a pious prelate, Bishop Anselmo Basilici of Sutri and Nepi, asked the Holy See to institute a special feast in honor of Saint Philomena, and the Bishop of Nola prepared a lesson for the Beviary,.. Most of the bishops of Italy, seeing the confidence of the people, supported their colleagues’ request. This was a realization that had been virtually unheard of previously, in favor of a Saint not mentioned in any martyrology, and whose name was not to be found in any hagiography but had been revealed solely by a simple sepulchral inscription. Yet the miracles that were occurring pleased this cause more eloquently than the most scrupulous annalists. Never the less, the head of the Church makes no haste in such serious and extraordinary matters. He decided to wait longer, to submit the dossiers for further examination and base his personal conviction on evident proofs - in a word, to allow experience, time and Heaven to continue their work of undeniable demonstration. The relation of an amazing event with tremendous repercussions made an impression on Leo XII. This event occurred on August 10, 1823. At Mugnano the annual novena had been inaugurated to commemorate the Translation of Filumena. A wooden statue, the gift of the Cardinal-Archbishop of Naples, was to be carried in the procession in the customary manner. No new ornament had been added except for a light reliquary containing a piece of bone, suspended from the neck by a ribbon. But after only a few steps, the porters declared that the pious image had become so heavy they could go no further. Many of those attending hastened to lend the men a hand, but to no avail. They were obliged, and with great difficulty, to return the statue to the church. This is precisely what had happened previously in 1805 when the relics had arrived. The statue immediately drew everyone’s gaze and attention. The face appeared to take on the expression of a living person and was a rosy red color. Such events at the start of the novena did not fail to excite people’s curiosity and provoke many comments. The following day pilgrims began flocking in from distant places, and they kept coming throughout the nine days. Three of them knelt before the statue; they had not been able to venerate the holy remains, which were covered by a veil. One of these men, a native of Monteverdi, thought he could see on the face a tiny globule that he said shone like crystal at the point of the chin. He reached out to touch it. This pearl melted between his fingers like a spreading drop of oil. Intrigued, his companions gazed more carefully at the statue and saw a sort of perspiration exuding from the head. This was so abundant that after wetting both sides of the face, it flowed down to the breast. These pilgrims immediately called to the people who were present in the church. Don Francesco di Lucia and the pastor of Mugnano hastened over and, greatly moved, observed the singular prodigy. The mysterious effusion localized at the head and breast of the venerable statue, left the rest of the body in tact. It was like an unctuous manna. News of this wonder quickly made h6te rounds. Local people and strangers alike filled the shrine. To satisfy their pious curiosity, the statue was set on the church floor and surrounded with candles. The people expressed their astonishment in acclamations, tears and prayers. The bells were rung to proclaim the event to the entire countryside. The crowd was still growing when another particularity, no less surprising, was noticed. The pink ribbon from which the reliquary was suspended, and which did not touch the moistened part in any way, was now also impregnated with a fragrant liquid. Everyone breathed in this delightful scent, more precious than the finest perfumes. When the first moment of surprise had passed, spectators who wished to verify things more seriously (including, no doubt, a few good-hearted skeptics) made several little experiments. They moistened the parts of the statue that had remained in tact and saw them dry immediately. Then they persistently wiped off the strange sweat, but it was unceasingly renewed beneath their hands. The experts succeeded one another, numerous and attentive. Seeing that the wonder persisted, no purely natural explanation seemed possible. For three whole days the wonder was visible an accessible to everyone. And it did not stop after the octave was over and the statue had been returned to its pedestal. On several occasions, the mysterious perfume continued to exude and to fill the entire church with its fragrance. There were countless witnesses of this event at Mugnano, but only the signatures of the most noteworthy and the most learned people were requested. The names form a long list in the old register of Our Lady of Grace, which cannot be read without a certain emotion. Although the means of information were less rapid an especially less multiplied than they are today, the news spread quite promptly throughout Italy and far beyond. 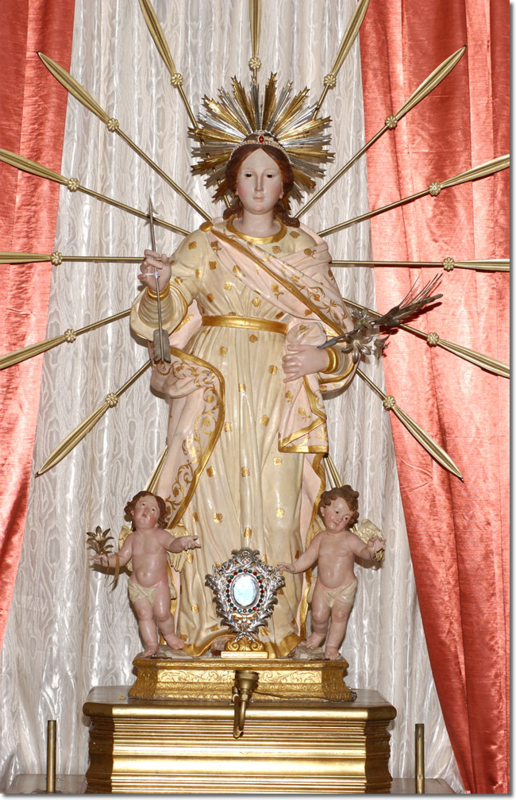 It contributed in great part to the unexpected popularization of devotion to Saint Philomena. Was it for the purpose that Providence had acted in such a manner? With such exceptional occurrences, was it God’s way of directing the attention of a spreading rationalism to human science’s incapacity to explain everything? Whatever the case, God showed here, just as He was to do at Lourdes and elsewhere, that He manifests Himself when He wishes in the wor4ld, which is His handiwork. The confidence of the faithful was increased by those events, and critics - always intrigued by tangible proofs - were able to look, touch, discover to their heart’s content. Saint Philomena’s bones produced another phenomenon several years later. Bishop Ansemlmo Basilici of Nepi and Sutri and great devotion to the young martyr. He had asked the Holy See for a feast and an office in her honor. 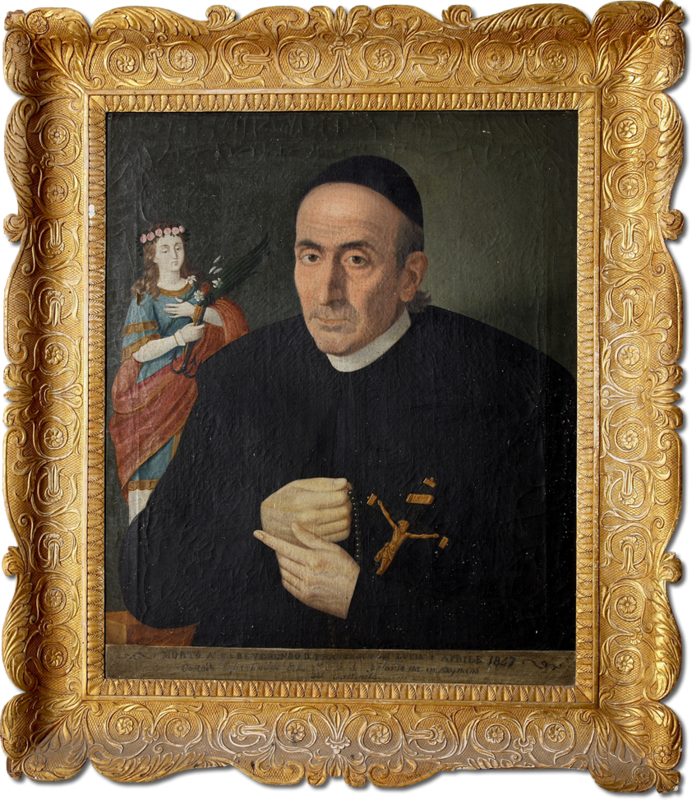 Devotion to Filumena was spreading throughout his diocese; but to encourage it even further, he asked his colleague from Nola for a fragment of the famous relics. Don Francesco di Lucia wrote on the subject, "In execution of my bishop’s orders, I sent the Bishop of Nepi a reliquary containing a bond of the Saint, and also a little paper containing dust from her bones, so that he might give some to the churches in his diocese in which Saint Philomena was most revered… This was a pinch of dust, rather less than more, an is proven by the authority of numerous witnesses, quoted in the transcript of the events." The happy bishop decided to send the desired little parcels at once to various parishes in reliquaries which he personal sealed. For this pious labor the prelate called his vicar general into the bishopric, along with the grand cantor, two canons of the cathedral, various ecclesiastics, and several house servants. One hundred and thirty reliquaries had been made, but it was noticed with stupefaction that the pinch of dust sent from Mugnano did not decrease in size as it was being distributed. It seemed to remain completely whole in the little container in which it had been deposited at the moment of its reception. Was this some kind of illusion? It would be assay to find out. Very attentively, they proceeded with another distribution. This time there was no doubt possible. An undeniable wonder was occurring before the very eyes of the bishop and his assistants. Many parcels had been taken, but the sacred ashes remained inexhaustible in their container. Those present were deeply moved. Monsignor Basilici, recognizing this as an intervention of a supernatural power, decided to make a third test for further proof. He convoked other members of the clergy and some of the notables of his diocese. On the prescribed day they all went to the bishop’s palace, where Monsignor had also brought in another local bishop to verify the experiment with him. This time they employed a simple, straightforward procedure. They set two envelopes in front of the witnesses: in one of them was the dust sent from Mugnano; in the other, but in slightly smaller quantity, was dust of the bones of various martyrs. The distribution began. Parcels were taken in equal quantities from both envelopes and then placed in different reliquaries. Naturally, all eyes were wide open; and intense curiosity immobilized the spectators. The delicate, meticulous work went on until the ashes of the various martyrs had run out. When the envelope containing them was empty, it was observed that the contents of the other one were the same as they had been before. Was his not a miracle? Most of the witnesses thought so, and the people proclaimed it so. From then on, the Bishop of Nepi favourably welcomed all the requests addressed to him. They arrived more numerous with each passing day, as fame of the wonder spread. The number of parcels expediad was so great that, accounting to the prelate’s testimony, it could be qualified as "incredible." In the presence of such extraordinary events, Monsignor Basilica deemed I his duty to inform the Sovereign Pontiff. He wrote to Gregory XVI as follows: "Most Holy Father, although request for relics of Saint Philomena have been countless, arriving from all over the world - Russia, Belgium, Poland, Greece, France, Armenia, America, etc. - satisfaction has been given to these requests." The desire of possessing a speck of that venerable dust was so ardent, he added, that the highest influences ere called upon by those who did not address themselves directly to him. The Bishop of Nepi also mentioned that when he had gone to Mugnano on May 31, 1835, to venerate the sacred remains from which a few parcels had multiplied so wonderfully before his very eyes, he had related the incident to the Apostolic Nuncio from Naples, Monsignor Ferretti. That prelate had confided to him, "It must be the same multiplication that occurred in my hands, since the dust from the relics of the holy martyr that I too received from Mugnano was only a very little quantity; nevertheless, after distributing it among many persons, there was still some left." To his report the bishop annexed the list of distributions made at Nepi in June and July, with the dates and names of the witnesses. There had been five hundred such distributions. He carefully noted the canonical formalities that had been observed under such delicate circumstances. Leaving Mugnano and Naples, Monsignor Basilici went to Rome where the Holy Father awaited him. The virgin martyr’s fame was already great in the city of the Popes. On June 16, 1835, he was received by Gregory XVI, who wished to learn the facts directly from an authorized eyewitness. He explained the case himself. The Holy Father listened attentively to the prelate’s exposition, down to the slightest details, and questioned him on the circumstances surrounding various proofs. Monsignor Basilici presented Gregory XVI with the casket containing the relics, the documentary evidence, and the transcripts of all that had occurred during the multiplication of the ashes. Deeply moved, the Pope mandated the Cardinal Prefect of the Congregation of Rites to examine the casket and study the bishop’s narrative and the body of testimony in order to proceed with a new test which would not omit any guarantee of authenticity. The following day, June 17, a commission composed of numerous personages of the Pontifical Court and the city was solemnly gathered. Since Cardinal Pedicini, the prefect, was absent, Cardinal Galiffi, vice prefect, presided. All the witnesses were put under oath. The moment had come for a final, decisive test. The cardinal personally removed the parcels, taking out forty-five. The prodigy continued.. The experiment was conclusive. The documents had told the truth! And so it was that in this hall of the Apostolic Palace, just as in Sutri and Naples, just as in Rome itself two days before, Philomena’s relics "returned to life from their resting place." How could anyone explain such things without taking the hand of God into account? But Gregory XVI did not wish to make a declaration yet. When the Congregation of rites gathered in the Quirinal Palace to examine, "with all the accustomed attention, the various motives exposed by the Most Reverend Bishop of Sutri and Nepi, in conformity with the orders of the Most Holy Father, so as to obtain from the Holy Apostolic See an Office with the Mass of the Common of a Virgin and Martyr in honor of Saint Philomena, whose devotion, which has spread to every corner of the world, had inclined other prelates to make the same request," the members of that venerable gathering left no stone unturned in their discussions. An official document bears witness to the fact that after having "submitted everything to an in-depth examination (and) deliberately weighed certain special circumstances in the case in question," the Congregation was of the opinion that "there was reason to give a favorable response for the Office3, Mass of the Common, and Fourth Lesson proper to the double minor rite." The rescript mentions some exceptional events relative to devotion to the virgin and martyr. Fray Andresito (Andres Garcia Acosta) – Affectionately called the "Beggar Saint," he was known in Chile for his tireless spreading of devotion to St. Philomena and was dedicated to working the streets of Santiago on behalf of the needy. Saint Madeleine Sophie Barat – She was foundress of the Ladies of the Sacred Heart and a great devotee of St. Philomena. In September 1866, Barat layed her hands on the wounds of one of her postulants before she was to have an operation, and to the doctor’s astonishment, the patient was miraculously healed. She attributed this healing to St. Philomena. Saint Peter Chanel – The first martyr of the ocean was known for his missionary work and for his simple baggage of a crucifix on his breast, Rosary in his pocket, and pictures of the Virgin Mary, St. Joseph and St. Philomena in his breviary. 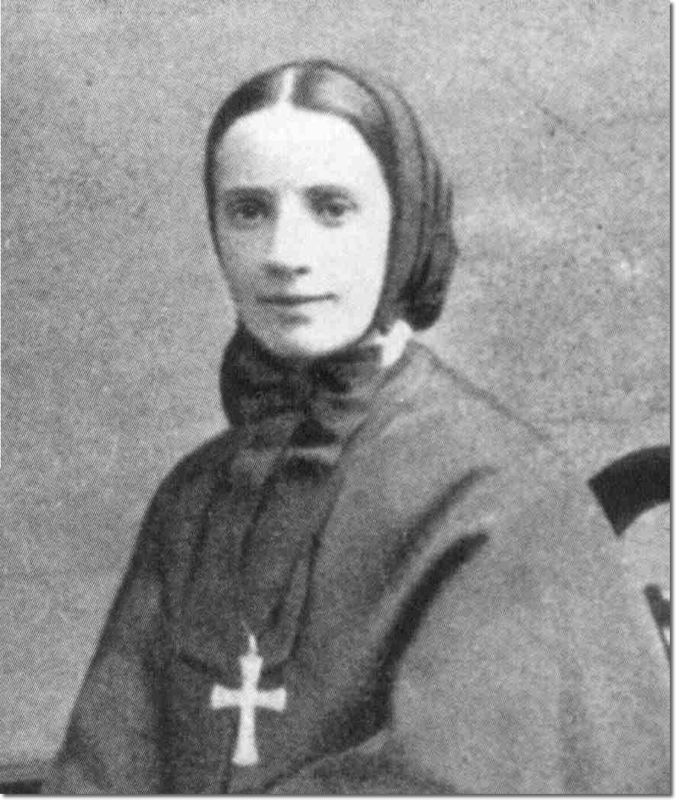 Saint Francesca Cabrini – Mother Cabrini was the first saint canonized from the United States. She left Italy for the United States in 1899. She was named the Saint of the Immigrants and always carried a statue of St. Philomena. Maria Cristina di Savoia – Servant of God and a noted benefactor of the Sanctuary, she conceived the heir to the throne of Naples, Francis II, through the intercession of the Saint. For the grace received, she donated a baby made of silver to the Sanctuary. 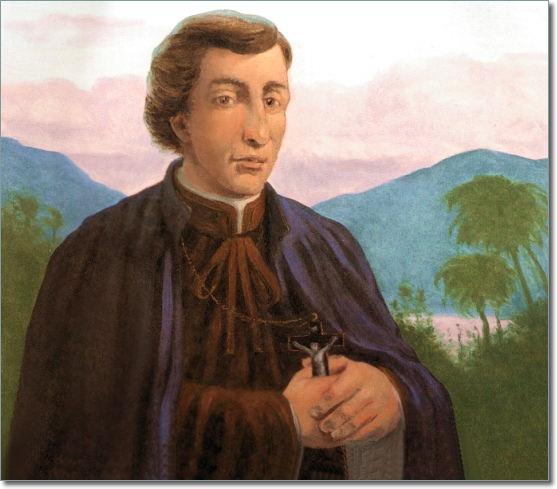 Saint Joseph Damien de Veuster of Molokai – The "Leper Priest" and hero of Molokai, he dedicated his first parish church and home on the island to St. Philomena. He gave his life to care for lepers and was particularly concerned for children segregated in the colony. 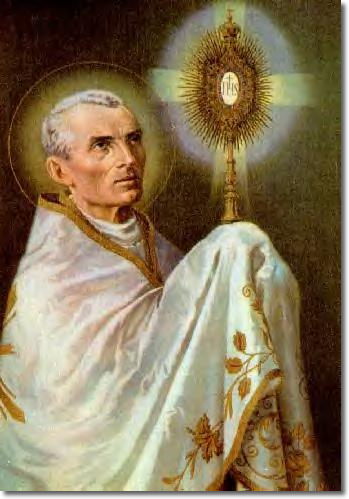 Saint Peter Julian Eymard – A French Catholic priest and Apostle of the Eucharist, he always kneeled before a Sacred Relic of St. Philomena and was cured in 1854 after having recited a novena in her honor. Blessed Bartholomew Longo – A devotee of the Little Saint and apostle of the Rosary, he placed the Shrine of Our Lady of the Rosary in the Valley of Pompeii, visited daily by nearly 10,000 pilgrims, under her patronage. Sister Maria Luisa of Jesus – A fervent devotee of the Saint, she founded the religious order of the Sisters of Our Lady of Sorrows and Saint Philomena in Naples. She received details of the historical background of St. Philomena through private revelations in August 1833 which were approved by the Holy Office in December of that year. Saint Maria Magdalen of Canossa – Founder of the Institution of the Daughters of Charity and dedicated to educating the poor and serving the sick, she spread devotion to St. Philomena throughout Southern Italy. Saint John Neumann – He was a devotee of St. Philomena from Philadelphia and in 1846 completed the St. Philomena Church in Pittsburg. He was appointed bishop of Philadelphia in 1852 and was the first to organize a diocesan Catholic school system. According to the Diocese of Pittsburgh Archives, St. Philomena, once located in Pittsburgh's Strip District, was founded in 1839 which was the first German parish in the diocese. 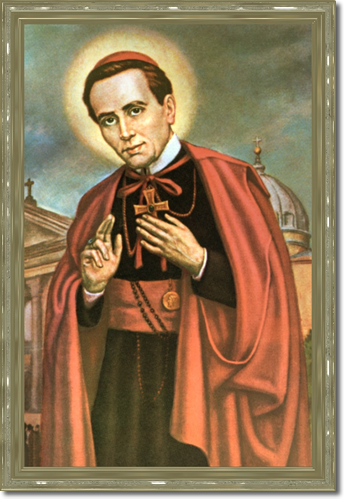 St. John Neumann and Blessed Francis Seelos are among the priests that served at St. Philomena. The cornerstone of the church was laid on May 26, 1842 and the completed church was dedicated on October 4, 1846. St. John Neumann attended the laying of the cornerstone on that date. The Pennsylvania Railroad purchased this church on April 15, 1922. The last Mass was held in St. Philomena in the Strip District on November 16, 1925. St. Philomena was relocated to Pittsburgh in the Squirrel Hill section. Due to the population loss, the church closed after serving the community for 70 years. St. Philomena closed in 1993 and the church was sold shortly afterwards. Saint Pio of Pietrelcina (Padre Pio) – Ordained in the priesthood in 1910, he experienced a mystical phenomenon in 1918 when he received the visible marks of the crucifixion, making him the first stigmatized priest in the history of Church. He was known for his ability to read the hearts of penitents and was proclaimed a saint by Pope John Paul II in 2002. Distressed by the rumors about the cult of the Saint, Padre Pio told an Irish devotee of the Little Saint, Mary Philomena Mulcahy: "Saint Philomena is in Paradise, the confusion is the work of Satan." Blessed Anna Maria Taigi – She achieved her sanctification by living an ordinary life of wife and mother and through her total surrender to God, help of those in need, and as an active member of the Third Order of the Most Holy Trinity. She was known for her supernatural gifts to see present or future events as well as the state of grace of individuals, living or dead. She witnessed the healing of her granddaughter’s damaged eye after it was rubbed with the Holy Oil of St. Philomena. Anna Maria was greatly devoted to St. Philomena and invoked her daily. At the time of her death, she placed her children under the saint’s protection.